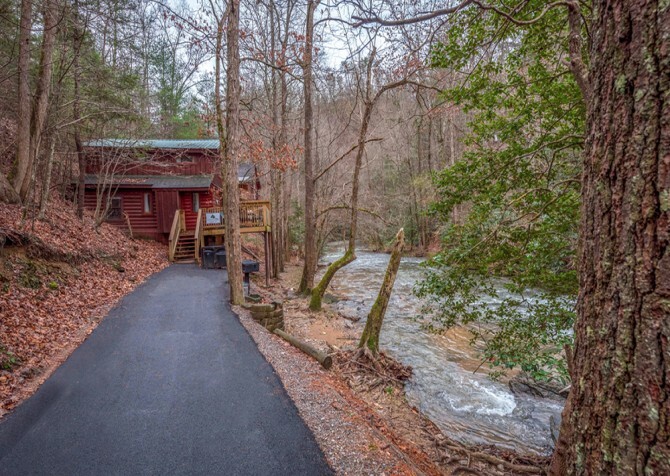 When you pull up to this gorgeous 3-bedroom + loft, 3 ½-bathroom cabin for 10 in Keaton's Bear Cove Creek Retreat, you’ll be greeted by classic wood exteriors, multiple deck spaces (where you can imagine enjoying your coffee), and a picturesque tree-studded setting. Inside Keaton’s Nature’s Dream, welcome spaces and modern amenities await for relaxing evenings, fun days, and beyond in Pigeon Forge, TN. Start in the open kitchen, where bright red cabinets and tons of counterspace make it a convenient and easy place to whip up meals and snacks for the whole group. The dining table has space for 8, and an electric fireplace and big screen TV here also make it the perfect spot for hanging out to play games late into the night. And don’t forget about the pool table and outdoor hot tub! At night, enjoy 3 cozy bedrooms with enough bathrooms to make it easy to get ready for going into town. Cozy couches and seating throughout the cabin are great for groups who love to hang out, and there are plenty of other conveniences like wireless internet, a charcoal (picnic-style) grill, a washer and dryer, and an indoor jetted tub for soaking tired muscles at night. When you need some time to yourself, grab a book and relax on the porch swing with a cold drink — with forest trees all around. Welcoming you into the home is the charming seating area at the entrance, perfect for letting the young ones watch a little TV while you unload the cars. Adding to the comfort and function of the space is a plump sofa (doubles as a sleeper), arm chair, and coffee table. And the pass-through into the kitchen makes this room ideal for keeping an eye on the kiddos while preparing dinner. Simply fetch snacks and drinks and easily pass them through while they playfully wait. Hardwood floors and natural lighting mix with plush seating and a cozy atmosphere to bring you straight into relaxation in the living room at Keaton’s Nature’s Dream. Rest in the arm chair after your travels, snuggle with your spouse on the love seat, pile onto the sofa for movie nights on the big screen TV, and prop your feet up in the recliner with the new novel you’ve been planning to read for months (it’s your time now!). There’s even a fun pool table nearby, ready to challenge friends and family to a game battle — winner choses the next Pigeon Forge attraction! Fully equipped with all the stainless-steel appliances, pots and pans, dinnerware, and mugs you’ll need, the kitchen at Keaton’s Nature’s Dream features beautiful high ceilings with a stained-glass window, rustic red cabinetry, and an open concept into the dining area. Cook hot meals on the stove, warm biscuits in the oven, brew pots of joe, blend fruit smoothies, store restaurant leftovers in the fridge, and keep the popcorn flowing for movie nights with 2 microwaves! Whether you’re looking to create a new recipe, whip up a family favorite, or simply reheat pepperoni pizza, this kitchen is more than ready. Moving dishes from the kitchen to the dining area will be a breeze as the space is open concept. 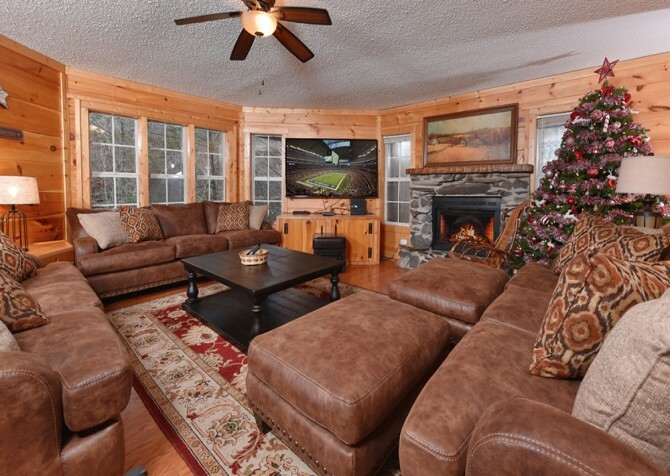 Here you’ll find seating for 8, a mood-setting electric fireplace, and even a flatscreen TV. Not only great for dining, this area is quite versatile. Bust out board and card games from home, set out coloring sets for the kids, collect your thoughts with midnight cocoa and a friend, start writing your next novel, sketch your favorite mountain scene from the day’s hike…you name it! With 3 bedrooms + the loft and a sleeper sofa, everyone will have a cozy space to rest their head every evening. 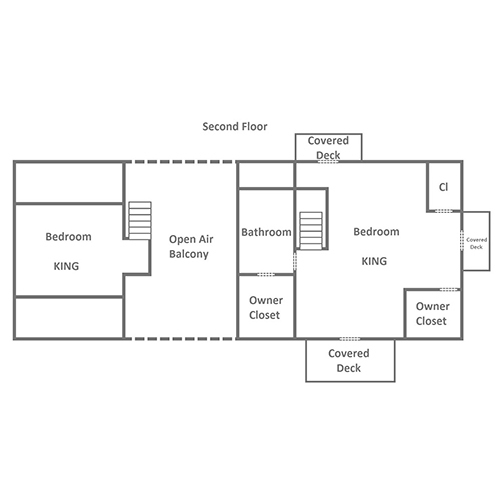 The entry level is home to 2 bedrooms, each with a queen-size bed and a whopping big screen TV! The second floor boasts the master suite with tons of space, a king-size bed, a flatscreen TV, and best of all — a formal seating area plus 3 private decks! Sip coffee at the quaint outdoor table for 2 in the mornings and enjoy champagne under the stars every night. In the loft, you’ll find another king-size bed and 2 arm chairs. And don’t forget to slip into the indoor jetted tub for a soothing bath before bed! Pull into the flat, paved driveway with parking for 3-4 vehicles, walk straight onto the front porch (no steps), and chill in the multi-seat rocking chair and gliders. Or easily head around to the wraparound deck with rocking chairs, swiftly followed by an outdoor dining table (great for barbecues from the large charcoal, picnic-style grill), and finally the steamy hot tub! With tranquil woodsy views to enjoy, this semi-private cabin will help you reconnect with nature. 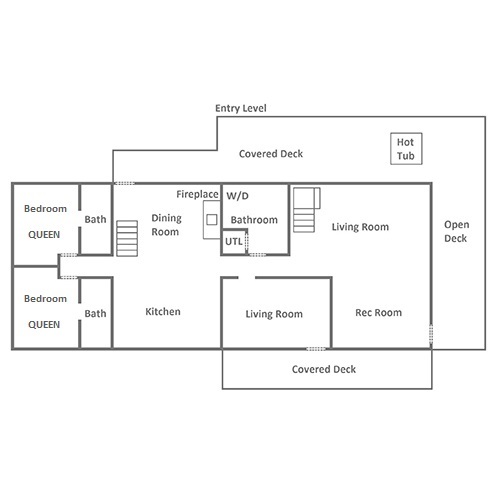 Oh, and remember the 3 private decks attached to the master suite upstairs! Providing complimentary wireless internet plus a washer and dryer, Keaton’s Nature’s Dream is a vacation rental where you can feel right at home, posting trip photos to social media and keeping clothes and towels fresh throughout your stay. Less than 6 miles to the heart of Pigeon Forge fun, Keaton’s Nature’s Dream is a great option close to rides, games, shops, and restaurants. A mere minute away, Wears Valley Zipline Adventures will have your adrenaline pumping in no time hundreds of feet above the forest floor! Shop until you drop, play games all day, ride the Great Smoky Mountain Wheel, and eat everything in sight at The Island — a mega popular shopping and entertainment complex in Pigeon Forge. Famed by its red roof, the Pigeon Forge Factory Outlet Mall hosts a hodgepodge of stores, giving everyone in your group a place to shop.